In physics, angular momentum (rarely, moment of momentum or rotational momentum) is the rotational equivalent of linear momentum. It is an important quantity in physics because it is a conserved quantity—the total angular momentum of a closed system remains constant. 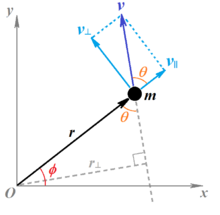 In three dimensions, the angular momentum for a point particle is a pseudovector r × p, the cross product of the particle's position vector r (relative to some origin) and its momentum vector p = mv. This definition can be applied to each point in continua like solids or fluids, or physical fields. Unlike momentum, angular momentum does depend on where the origin is chosen, since the particle's position is measured from it. Just like for angular velocity, there are two special types of angular momentum: the spin angular momentum and the orbital angular momentum. The spin angular momentum of an object is defined as the angular momentum about its centre of mass coordinate. The orbital angular momentum of an object about a chosen origin is defined as the angular momentum of the centre of mass about the origin. The total angular momentum of an object is the sum of the spin and orbital angular momenta. The orbital angular momentum vector of a particle is always parallel and directly proportional to the orbital angular velocity vector ω of the particle, where the constant of proportionality depends on both the mass of the particle and its distance from origin. However, the spin angular momentum of the object is proportional but not always parallel to the spin angular velocity Ω, making the constant of proportionality a second-rank tensor rather than a scalar. Angular momentum is additive; the total angular momentum of any composite system is the (pseudo)vector sum of the angular momenta of its constituent parts. For a continuous rigid body, the total angular momentum is the volume integral of angular momentum density (i.e. angular momentum per unit volume in the limit as volume shrinks to zero) over the entire body. Torque can be defined as the rate of change of angular momentum, analogous to force. The net external torque on any system is always equal to the total torque on the system; in other words, the sum of all internal torques of any system is always 0 (this is the rotational analogue of Newton's Third Law). Therefore, for a closed system (where there is no net external torque), the total torque on the system must be 0, which means that the total angular momentum of the system is constant. The conservation of angular momentum helps explain many observed phenomena, for example the increase in rotational speed of a spinning figure skater as the skater's arms are contracted, the high rotational rates of neutron stars, the Coriolis effect, and the precession of gyroscopes. In general, conservation does limit the possible motion of a system, but does not uniquely determine what the exact motion is. In quantum mechanics, angular momentum is an operator with quantized eigenvalues. Angular momentum is subject to the Heisenberg uncertainty principle, meaning that at any time, only one component can be measured with definite precision; the other two cannot. Because of this, it turns out that the notion of an elementary particle (i.e. the excitation of a quantum field) literally "spinning" about an axis does not exist. Nevertheless, for technical reasons, elementary particles still possess a spin angular momentum, but this angular momentum does not correspond to spinning motion in the ordinary sense. Velocity of the particle m with respect to the origin O can be resolved into components parallel to (v∥) and perpendicular to (v⊥) the radius vector r. The angular momentum of m is proportional to the perpendicular component v⊥ of the velocity, or equivalently, to the perpendicular distance r⊥ from the origin. should be referred to as the angular momentum relative to that center. is the length of the moment arm, a line dropped perpendicularly from the origin onto the path of the particle. It is this definition, (length of moment arm)×(linear momentum) to which the term moment of momentum refers. Relationship between force (F), torque (τ), momentum (p), and angular momentum (L) vectors in a rotating system. r is the position vector. is the perpendicular component of the motion, as above. is the particle's moment of inertia, sometimes called the second moment of mass. It is a measure of rotational inertia. Because moment of inertia is a crucial part of the spin angular momentum, the latter necessarily includes all of the complications of the former, which is calculated by multiplying elementary bits of the mass by the squares of their distances from the center of rotation. Therefore, the total moment of inertia, and the angular momentum, is a complex function of the configuration of the matter about the center of rotation and the orientation of the rotation for the various bits. may be considered as concentrated. Angular momentum's dependence on position and shape is reflected in its units versus linear momentum: kg·m2/(rad·s), N·m·s/rad, or J·s/rad for angular momentum versus kg·m/s or N·s for linear momentum. Angular momentum's units can be interpreted as torque·time or as energy·time per angle. An object with angular momentum of L N·m·s can be reduced to zero rotation (all of the rotational energy can be transferred out of it) by an angular impulse of L N·m·s or equivalently, by torque or work of L N·m for one second, or energy of L J for one second. This is the rotational analog of Newton's Second Law. Note that the torque is not necessarily proportional or parallel to the angular acceleration (as one might expect). The reason for this is that the moment of inertia of a particle can change with time, something that cannot occur for ordinary mass. Seen another way, a rotational analogue of Newton's first law of motion might be written, "A rigid body continues in a state of uniform rotation unless acted by an external influence." Thus with no external influence to act upon it, the original angular momentum of the system remains constant. are parallel vectors. Therefore, the angular momentum of the body about the center is constant. This is the case with gravitational attraction in the orbits of planets and satellites, where the gravitational force is always directed toward the primary body and orbiting bodies conserve angular momentum by exchanging distance and velocity as they move about the primary. Central force motion is also used in the analysis of the Bohr model of the atom. The conservation of angular momentum explains the angular acceleration of an ice skater as she brings her arms and legs close to the vertical axis of rotation. By bringing part of the mass of her body closer to the axis, she decreases her body's moment of inertia. Because angular momentum is the product of moment of inertia and angular velocity, if the angular momentum remains constant (is conserved), then the angular velocity (rotational speed) of the skater must increase. Mass is often unimportant in orbital mechanics calculations, because motion is defined by gravity. The primary body of the system is often so much larger than any bodies in motion about it that the smaller bodies have a negligible gravitational effect on it; it is, in effect, stationary. All bodies are apparently attracted by its gravity in the same way, regardless of mass, and therefore all move approximately the same way under the same conditions. The first term is the angular momentum of the center of mass relative to the origin. 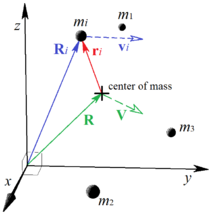 Similar to Single particle, below, it is the angular momentum of one particle of mass M at the center of mass moving with velocity V. The second term is the angular momentum of the particles moving relative to the center of mass, similar to Fixed center of mass, below. The result is general—the motion of the particles is not restricted to rotation or revolution about the origin or center of mass. The particles need not be individual masses, but can be elements of a continuous distribution, such as a solid body. is tiny by everyday standards, about 10−34 J s, and therefore this quantization does not noticeably affect the angular momentum of macroscopic objects. However, it is very important in the microscopic world. For example, the structure of electron shells and subshells in chemistry is significantly affected by the quantization of angular momentum.
. However, the Heisenberg uncertainty principle tells us that it is not possible for all six of these quantities to be known simultaneously with arbitrary precision. Therefore, there are limits to what can be known or measured about a particle's angular momentum. It turns out that the best that one can do is to simultaneously measure both the angular momentum vector's magnitude and its component along one axis.
. (The "exp" in the formula refers to operator exponential) To put this the other way around, whatever our quantum Hilbert space is, we expect that the rotation group SO(3) will act on it. There is then an associated action of the Lie algebra so(3) of SO(3); the operators describing the action of so(3) on our Hilbert space are the (total) angular momentum operators. Newton's derivation of the area law using geometric means. ^ Wilson, E. B. (1915). Linear Momentum, Kinetic Energy and Angular Momentum. The American Mathematical Monthly. XXII. Ginn and Co., Boston, in cooperation with University of Chicago, et al. p. 190 – via Google books. ^ Worthington, Arthur M. (1906). Dynamics of Rotation. Longmans, Green and Co., London. p. 21 – via Google books. ^ Taylor, John R. (2005). Classical Mechanics. University Science Books, Mill Valley, CA. p. 90. ISBN 978-1-891389-22-1. ^ Dadourian, H. M. (1913). Analytical Mechanics for Students of Physics and Engineering. D. Van Nostrand Company, New York. p. 266 – via Google books. ^ Watson, W. (1912). General Physics. Longmans, Green and Co., New York. p. 33 – via Google books. ^ Barker, George F. (1893). Physics: Advanced Course (4th ed.). Henry Holt and Company, New York. p. 66 – via Google Books. ^ Barker, George F. (1893). Physics: Advanced Course (4th ed.). Henry Holt and Company, New York. pp. 67–68 – via Google Books. ^ Oberg, Erik; et al. (2000). Machinery's Handbook (26th ed.). Industrial Press, Inc., New York. p. 143. ISBN 978-0-8311-2625-4. ^ Watson, W. (1912). General Physics. Longmans, Green and Co., New York. p. 34 – via Google books. ^ Kent, William (1916). The Mechanical Engineers' Pocket Book (9th ed.). John Wiley and Sons, Inc., New York. p. 517 – via Google books. ^ Oberg, Erik; et al. (2000). Machinery's Handbook (26th ed.). Industrial Press, Inc., New York. p. 146. ISBN 978-0-8311-2625-4. ^ Oberg, Erik; et al. (2000). Machinery's Handbook (26th ed.). Industrial Press, Inc., New York. pp. 161–162. ISBN 978-0-8311-2625-4. ^ Kent, William (1916). The Mechanical Engineers' Pocket Book (9th ed.). John Wiley and Sons, Inc., New York. p. 527 – via Google books. ^ Rankine, W. J. M. (1872). A Manual of Applied Mechanics (6th ed.). Charles Griffin and Company, London. p. 507 – via Google books. ^ a b Crew, Henry (1908). The Principles of Mechanics: For Students of Physics and Engineering. Longmans, Green, and Company, New York. p. 88 – via Google books. ^ Worthington, Arthur M. (1906). Dynamics of Rotation. Longmans, Green and Co., London. p. 82 – via Google books. ^ Worthington, Arthur M. (1906). Dynamics of Rotation. Longmans, Green and Co., London. p. 11 – via Google books. ^ Stephenson, F. R.; Morrison, L. V.; Whitrow, G. J. (1984). "Long-term changes in the rotation of the earth – 700 B.C. to A.D. 1980". Philosophical Transactions of the Royal Society. 313 (1524): 67. Bibcode:1984RSPTA.313...47S. doi:10.1098/rsta.1984.0082. +2.40 ms/century divided by 36525 days. ^ Dickey, J. O.; et al. (1994). "Lunar Laser Ranging: A Continuing Legacy of the Apollo Program" (PDF). Science. 265 (5171): 482–90, 486. Bibcode:1994Sci...265..482D. doi:10.1126/science.265.5171.482. PMID 17781305. ^ Landau, L. D.; Lifshitz, E. M. (1995). The classical theory of fields. Course of Theoretical Physics. Oxford, Butterworth–Heinemann. ISBN 978-0-7506-2768-9. ^ Battin, Richard H. (1999). An Introduction to the Mathematics and Methods of Astrodynamics, Revised Edition. American Institute of Aeronautics and Astronautics, Inc. p. 115. ISBN 978-1-56347-342-5. ^ Wilson, E. B. (1915). Linear Momentum, Kinetic Energy and Angular Momentum. The American Mathematical Monthly. XXII. Ginn and Co., Boston, in cooperation with University of Chicago, et al. p. 188, equation (3) – via Google books. ^ Wilson, E. B. (1915). Linear Momentum, Kinetic Energy and Angular Momentum. The American Mathematical Monthly. XXII. Ginn and Co., Boston, in cooperation with University of Chicago, et al. p. 191, Theorem 8 – via Google books. ^ Synge and Schild, Tensor calculus, Dover publications, 1978 edition, p. 161. ISBN 978-0-486-63612-2. ^ R.P. Feynman; R.B. Leighton; M. Sands (1964). Feynman's Lectures on Physics (volume 2). Addison–Wesley. pp. 31–7. ISBN 978-0-201-02117-2. ^ Ballantine, K. E.; Donegan, J. F.; Eastham, P. R. (2016). "There are many ways to spin a photon: Half-quantization of a total optical angular momentum". Science Advances. 2 (4): e1501748. Bibcode:2016SciA....2E1748B. doi:10.1126/sciadv.1501748. PMC 5565928. PMID 28861467. ^ Littlejohn, Robert (2011). "Lecture notes on rotations in quantum mechanics" (PDF). Physics 221B Spring 2011. Retrieved 13 Jan 2012. ^ Okulov, A Yu (2008). "Angular momentum of photons and phase conjugation". Journal of Physics B: Atomic, Molecular and Optical Physics. 41 (10): 101001. arXiv:0801.2675. Bibcode:2008JPhB...41j1001O. doi:10.1088/0953-4075/41/10/101001. ^ Okulov, A.Y. (2008). "Optical and Sound Helical structures in a Mandelstam – Brillouin mirror". JETP Letters (in Russian). 88 (8): 561–566. Bibcode:2008JETPL..88..487O. doi:10.1134/s0021364008200046. ^ Newton, Isaac (1803). "Axioms; or Laws of Motion, Law I". The Mathematical Principles of Natural Philosophy. Andrew Motte, translator. H. D. Symonds, London. p. 322 – via Google books. ^ see Borrelli, Arianna (2011). "Angular momentum between physics and mathematics" (PDF). 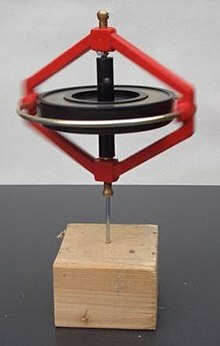 for an excellent and detailed summary of the concept of angular momentum through history. ^ Bruce, Ian (2008). "Euler : Mechanica Vol. 1". ^ Rankine, W. J. M. (1872). A Manual of Applied Mechanics (6th ed.). Charles Griffin and Company, London. p. 506 – via Google books. ^ Hayward, Robert B. (1864). "On a Direct Method of estimating Velocities, Accelerations, and all similar Quantities with respect to Axes moveable in any manner in Space with Applications". Transactions of the Cambridge Philosophical Society. 10: 1. Bibcode:1864TCaPS..10....1H. ^ see, for instance, Gompertz, Benjamin (1818). "On Pendulums vibrating between Cheeks". The Journal of Science and the Arts. III (V): 17 – via Google books. ; Herapath, John (1847). Mathematical Physics. Whittaker and Co., London. p. 56 – via Google books. ^ see, for instance, Landen, John (1785). "Of the Rotatory Motion of a Body of any Form whatever". Philosophical Transactions. LXXV (I): 311–332. doi:10.1098/rstl.1785.0016.